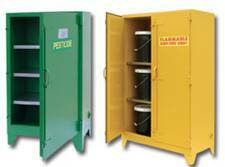 <B>Steel Acid Cabinet</B>&#133;double walled 18 ga. with 1-1/2&#148; insulating air space making them ideal for storage of flammable corrosive liquids. For nonflammable corrosives, lockable. 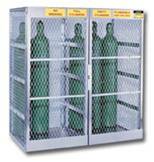 FM approved, meets OSHA regulations.&nbsp;Not recommended for storage of phenol, nitric acid or sulfuric acid.<BR><BR><B>Polyethylene Acid Storage Cabinets&#133;</B>one piece body for maximum protection against leaks and exceptional chemical resistance against highly aggressive liquids. FOB Shipping Point. Easy maneuvering.&nbsp;57 gal. sump capacity. Features handle and 360&deg; pivoting rear casters. Rear wheels brake for security. Large, internal sump.&nbsp;Drain plugs let you empty&nbsp;easily from below.&nbsp;Rolls through 36" doorways. Holds 500 lbs. of UDL weight. Measures 66" x 29" x 43" with handle. FOB Shipping Point. 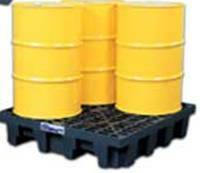 Hook 2, 4, 6, and 8 drum work stations&nbsp;with Link Locks to configure any shape spill platforms to meet your requirements. Tough polyethylene construction won&sup1;t rust or corrode. Low profile 6" H. Not forkliftable. FOB Shipping Point. Features 12 ga. bolt rings, sponge, rubber gaskets and optional corrosion resistant epoxy/phenolic lining. Each drum has multi-lingual "Salvage Drum" logo. Complies with D.O.T. 49 CFR 173.3 (c). FOB Shipping Point. Each station features a drench shower for full-body coverage and an eye wash. Units are supplied with 1/2" IPS chrome plated stay-open ball valve operated by cast aluminum push handle. Drench shower has an orange ABS plastic shower head and 1" IPS stay-open ball valve operated by a pull rod and handle. Furnished with intermediate piping, fittings and aluminum floor flanges. ETL certified. FOB Shipping Point. Made of 24 ga. steel for rough daily use. Complete with tested and approved closure and pressure relief mechanism with powder paint finish. Counterbalance designed for easy pouring. Large label ID Zone reduces misuse.&nbsp;FM approved and UL listed. Meets OSHA and NFPA requirements. FOB Shipping Point. Full size 55 Gallon Drum Kit comes with (10) 4 ft. socks, (5) 10 ft. socks, (5) pillows, 16 lb. bag Super Sorbent, (40) pads, & 4 disposal bags. 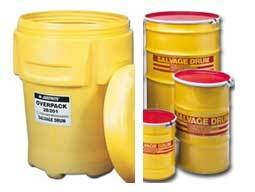 Sorption 41 gals.. <b>Universal Haz-Mat Spill Kits</b> Absorbs oils, acids, bases, solvents and toxins. Kits keep absorption supplies on-hand and ready to go, whether at a remote site or home operations. Kits are equipped with sorbents needed for an emergency. Haz-Mat Socks &amp; Pillows absorbs up to 14 times&nbsp;their own weight.&nbsp;Non-biodegradable,&nbsp;Exceeds EPA Landfill Disposal Requirements. Passes Paint&nbsp;&amp; TCLP test.&nbsp;FOB Shipping Point. Used to seal off drains in laboratories, warehouses and parking lots. Prevents liquids from entering sanitary drain or storm sewer. Cover should exceed drain size by 6". FOB Shipping Point.